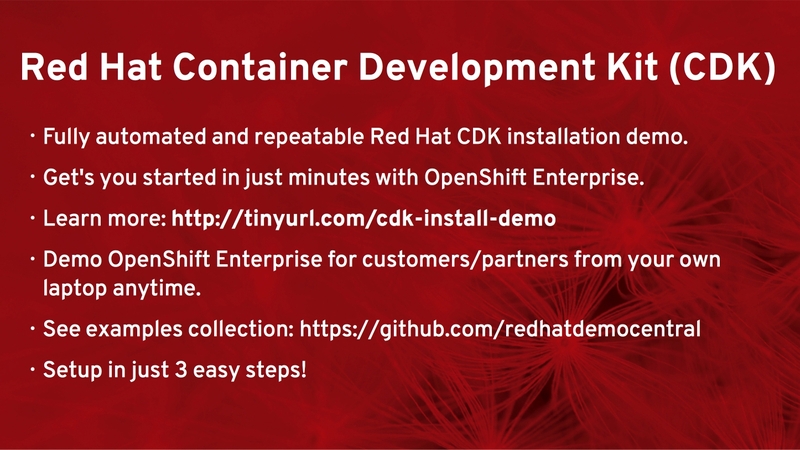 See what the most recent Red Hat Container Development Kit offers developers and how to get it up and running on your system in no time flat. 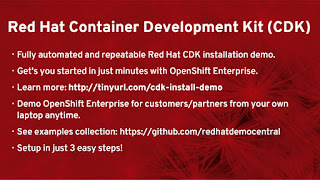 Last week, this project released version 2.2, so we updated the automated installation project called the Container Development Kit Install Demo. OpenShift: A containerized version of OpenShift can be started that can be accesses through a Web console in your browser or via the OpenShift command line tools. Explore your very own private PaaS developer experience with this container. Kubernetes: A container to set you up for exploring a Kubernetes cluster. It is setup to run as an all-in-one Kubernetes master to manage pods and node for running multiple pods. On top of this, you can start creating your own container based applications after you are comfortable with how these examples work. For more information on containers, a cloud stack, and why you need to care about this containerized stack for your application development, see the App Dev Cloud Stack series that takes you on a tour of the Red Hat Cloud Suite.